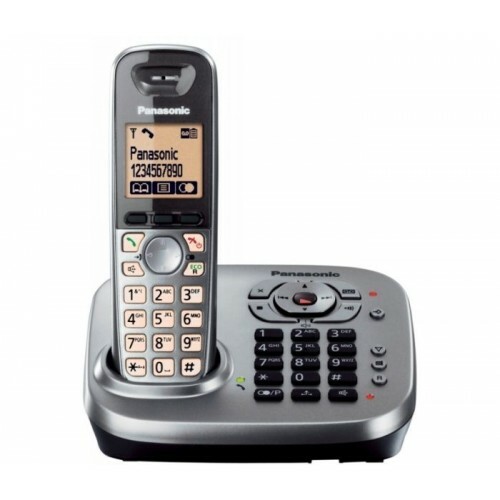 The Panasonic KX-TG6561 is a cordless phone featuring an answering machine, excellent sound quality and a number of other value-adding features. The handset sports a large backlit display, and you can also dial number using the keypad on the base station. The KX-TG6561 sports a sophisticated error correction system to help overcome the lower audio quality of conventional landline phones and deliver clearer phone calls with less interruptions and background noise. Utilising DECT technology, the cordless handset works at a distance of up to 50 metres indoors and 300 metres outdoors, while a built-in speakerphone facilitates hands-free phone calls during those longer conversations. Located in the base station of the KX-TG6561 is a convenient answering machine with enough capacity to record up to 20 minutes of phone calls. You can operate it to access and manage your messages from any handset registered to the system or from the base station itself, and when you have a new message waiting for you, an indicator light will turn on. There is also a remote answering feature that allows you to securely access your messages from any other phone. The phone sports memories for 100 names and numbers, while the call log remembers the last 50 phone calls. You can also choose from 16 polyphonic ringtones to personalise your phone. Easy to use and feature-rich, this cordless phone is ideal for either home or office use.